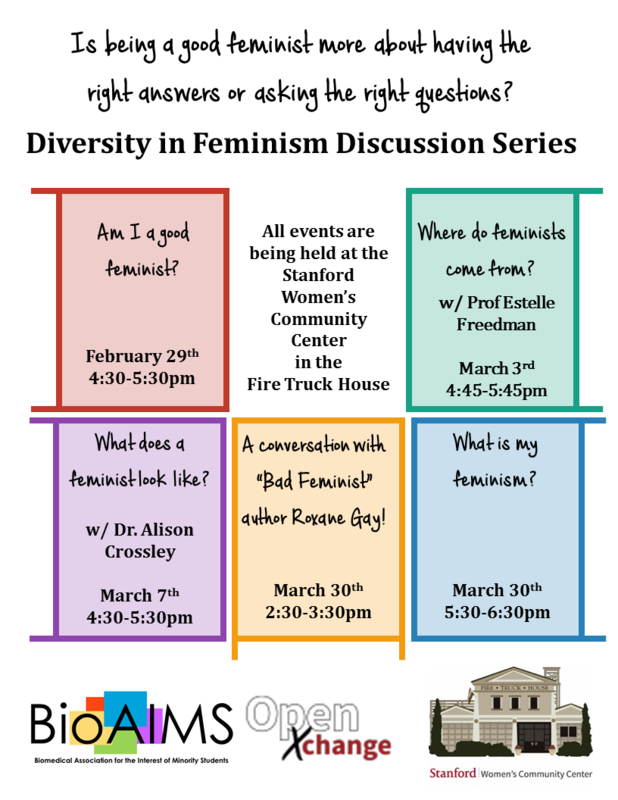 On Feb. 29, OpenXChange will launch a month-long, five-part discussion series about diversity in feminism titled “What’s My Feminism?” — the latest installment in its year-long effort to promote conversations about issues of national and global concern. “What’s My Feminism?” will take a multifaceted approach to feminism, spanning topics from the history of feminism to contemporary debates over “good” and “bad” feminism. Each hour-long session will combine strategies for engagement ranging from small group discussions to guest lectures by speakers such as feminist author Roxane Gay. The series was arranged through OpenXChange’s “Build It Lead It” grant program with the support of the Women’s Community Center (WCC) and the Biomedical Association for the Interest of Minority Students (BioAIMS). Alejandro Schuler Ph.D. ’19, men’s outreach coordinator at the WCC and one of three discussion series organizers, came up with the idea for organizing a discussion series while reading a string of op-eds in The Stanford Daily. The op-eds discussed the tactics of the campus Black Lives Matter movement after student demonstrators shut down the San Mateo-Hayward Bridge last winter. 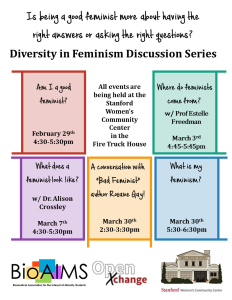 The OpenXChange discussion series will avoid a hyper-academic approach to feminist exploration, instead focusing on what Schuler called “empathy building,” or cultivating an awareness of the political, social and economic factors that shape individual experiences of feminism. Schuler emphasized that discussion attendees will be encouraged to share their personal backgrounds and encounters with feminism with one another. Keyla Badillo Ph.D. ’18, financial officer of BioAIMS and fellow discussion series coordinator, noted that the selection process for applicants aims to ensure a diversity of backgrounds among the series’ attendees. Badillo, a student from Puerto Rico, became involved in feminist causes during her undergraduate years at the University of Puerto Rico, during which she heard firsthand accounts of sexual assault from her sorority sisters. She described the differences between her experience of gender norms in Puerto Rico and at Stanford, as well as the difficulties of explaining feminism to her friends and family back home due to cultural differences. “There’s a lot of machismo [in Puerto Rico], and because we’re on this tiny island in the middle of the Caribbean, there’s not much exposure to other perspectives,” Badillo said. Valerie Troutman Ph.D. ’18, graduate program coordinator at the WCC and the final member of the team coordinating the discussion series, said that Gay’s book “Bad Feminist” contributed to her understanding of how intersectionality plays out in feminism. Applications to participate in the series close tonight. An earlier version of this article incorrectly referred to Keyla Badillo as an international student. The Daily regrets this error.